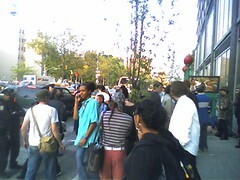 Some kind of Ukrainian party and other madness encountered on the lower east side today. 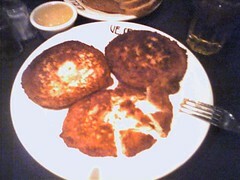 Potato latkes with apple sauce at Veselka. 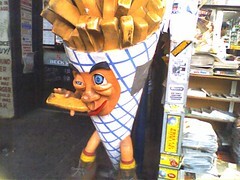 Pommes frites eating itself. I think this creature is from the planet as that huge hot dog on Ninth Street in Durham. The land where food eats itself. 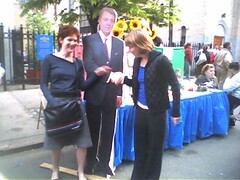 Women posing with a cutout of Ukranian president Viktor Yushchenko. 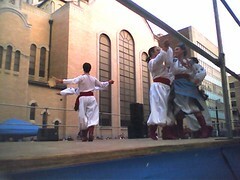 Dancers flying aroundthe stage. They were really excellent. 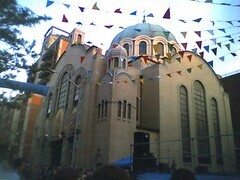 St. George’s Ukrainian Catholic Church. 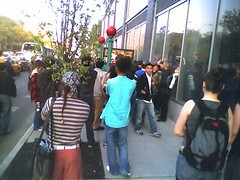 Crowds leaving the first stop on the kind of disappointing First Warm Night. That must be some party! 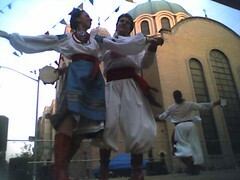 I was at the same Ukranian festival! 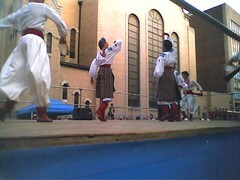 and agree, the dancing was very good. 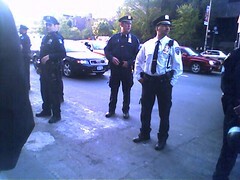 so I missed pdf AND	you are blogging the fest outside my apt. man, I am so lame….